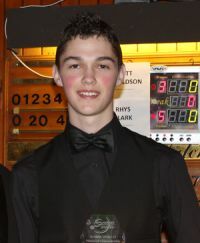 Under 19 event 4 final will take place in Minnesota Fats Glasgow on Wednesday 30th January 7.30 pm between Dylan Craig and Rhys Clark. Dylan is looking to narrow the gap with Rhys leading the tour by 60 points. Rhys Clark takes event 4 with an enfatic 4 – 0 win against Dylan Craig with breaks of 75 & 65 on the way.